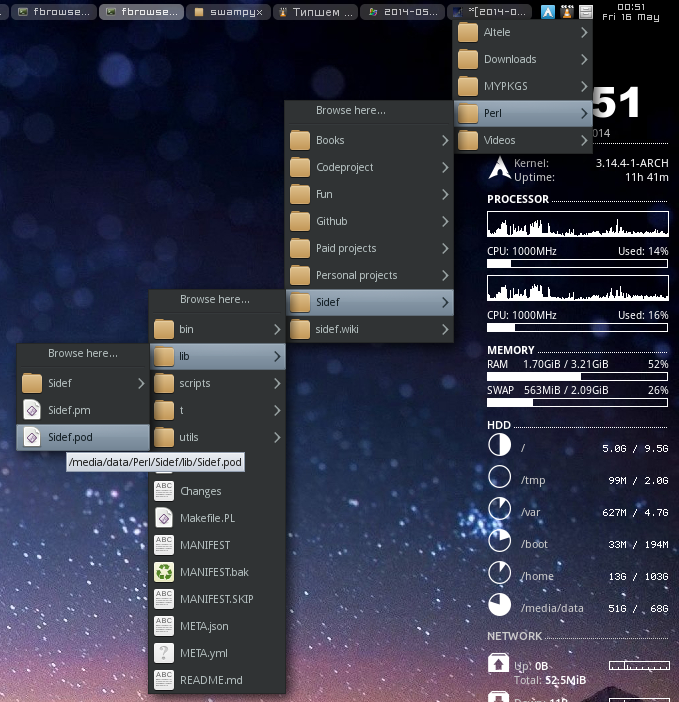 fbrowse-tray: browse the filesystem through a Gtk2 status icon (related to obbrowser). The filesystem is browsed recursively, but lazily, which means that a directory's content will be read only after hovering the mouse over a submenu entry. 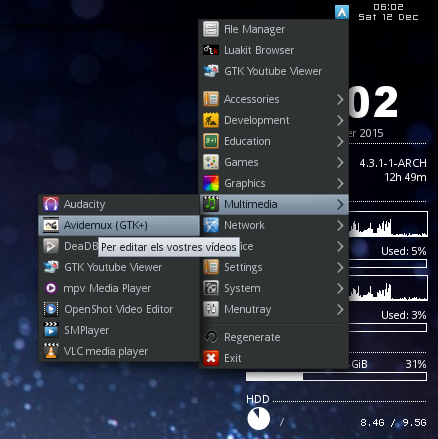 # GTK YouTube Viewer This application came to life in 12 September 2010 as my first GTK2/Glade learning project. Its scope is to search and play YouTube videos in a native player. It comes with various search options; it can search for videos, playlists and/or channels. The videos are streamed directly in a selected video player at the best resolution (customizable) and with closed-captions (if available). 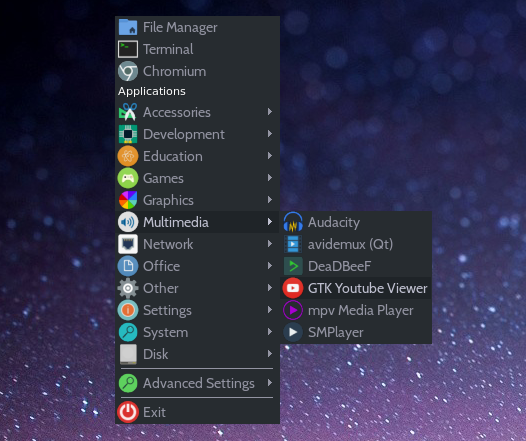 By default, the application supports three video players: MPV (recommended), MPlayer and VLC, but it allows the addition of more players inside the configuration file. obmenu-generator is a simple, lightweight, easily configurable Perl script that generates a full Openbox XML-menu based upon the information present in *.desktop application files (related to fbmenugen and menutray). 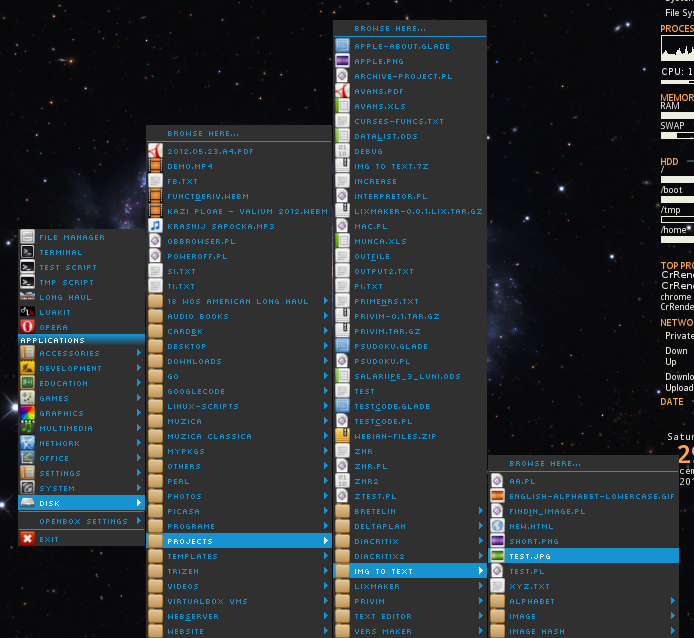 It has full support for icons (respecting the current icon theme) and can generate either a static or a dynamic menu. The parsing of the *.desktop files is provided by the Linux::DesktopFiles module. 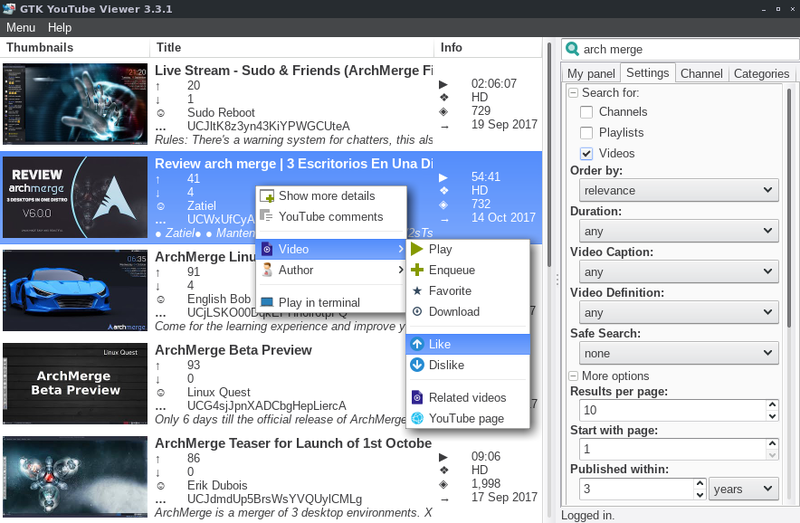 In a dynamic menu, the entries are updated automatically when a new application is installed or when the current icon theme is changed by the user. Starting with version 0.61, obmenu-generator introduced a new smart-cache system which will store all the required data from the *.destkop files in a new cache.db file, which is also updated automatically when a new application is (re)installed or when the config.pl or schema.pl are changed. With the new cache-system in place, a full menu with icons is generated in ~8ms (compared to ~60ms before). alsi is a system information tool, designed for Arch Linux, related to archey and screenfetch, but more configurable. In this post I would like to present some interesting generalized formulas for computing the partial sums of some arithmetical functions. RSA is a practical public-key cryptographic algorithm, which is widely used on modern computers to communicate securely over large distances. The acronym of the algorithm stands for Ron Rivest, Adi Shamir and Leonard Adleman, which first published the algorithm in 1978. # Generating `p` and `q` In order to generate a public and a private key, the algorithm requires two distinct prime numbers `p` and `q`, which are randomly chosen and should have, roughly, the same number of bits. By today standards, it is recommended that each prime number to have at least 2048 bits. The script supports a large variety of icons, thanks to File::MimeInfo module. In this post we're going to look over the main things required in designing and implementing a programming language. # Overview Before writing any code and before designing any language construct, we need to think about the core of the language that we want to create. The core of the language is the most important part which defines the language itself. A language can have more than one paradigm. For example, it can be imperative and object-oriented at the same time. 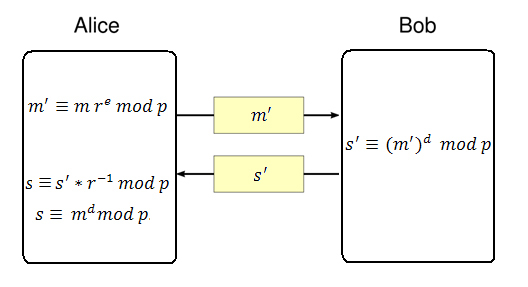 This are called multi-paradigm languages. After this two criteria are met, we can start thinking about a syntax for our language and begin carefully to design language constructs and implement them. 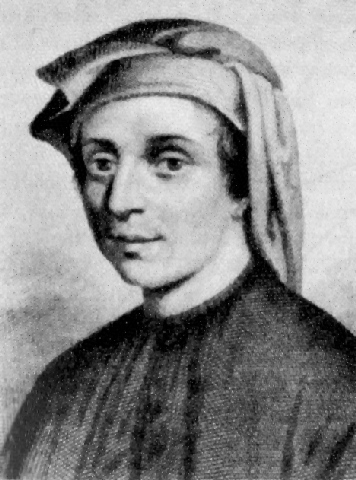 The Fibonacci sequence is, without doubt, one of the most popular sequences in mathematics and in popular culture, named after Italian mathematician Leonardo of Pisa (also known as Fibonacci, Leonardo Bonacci, Leonardo of Pisa, Leonardo Pisano Bigollo, or Leonardo Fibonacci), who first introduced the numbers in Western European with his book Liber Abaci, in 1202. 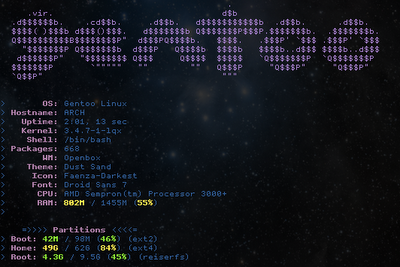 Menutray is a simple menu generator (related to obmenu-generator and fbmenugen). It generates a Perl script containing all the applications from the /usr/share/applications directory, ordered on categories. It also provides a schema file for customization. Starting with version 0.42, menutray supports Gtk3 with the --gtk3 option. fbmenugen is a simple menu generator for the Fluxbox WM (related to menutray and obmenu-generator). 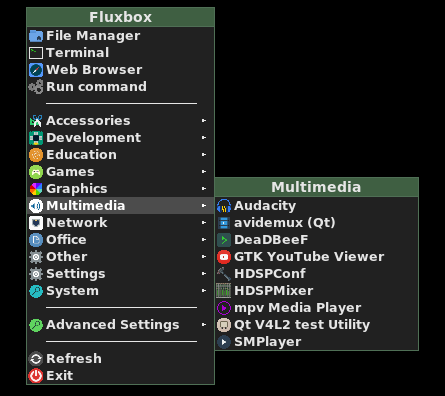 It generates a valid Fluxbox menu file with the applications from the /usr/share/applications directory, ordered on categories. It also provides a configuration file that allows the user to customize the menu.